Will an Acne Scrub Clear Your Skin? What Are Scrubs? Do Scrubs Clear Acne? You've been using an abrasive acne scrub to clean and clear your skin. But is an acne scrub the best way to treat acne? Scrubs are a type of skin care product designed to exfoliate the skin. Scrubs contain some type of abrasive ingredient to manually remove dead skin cells as the product is massaged over the skin. 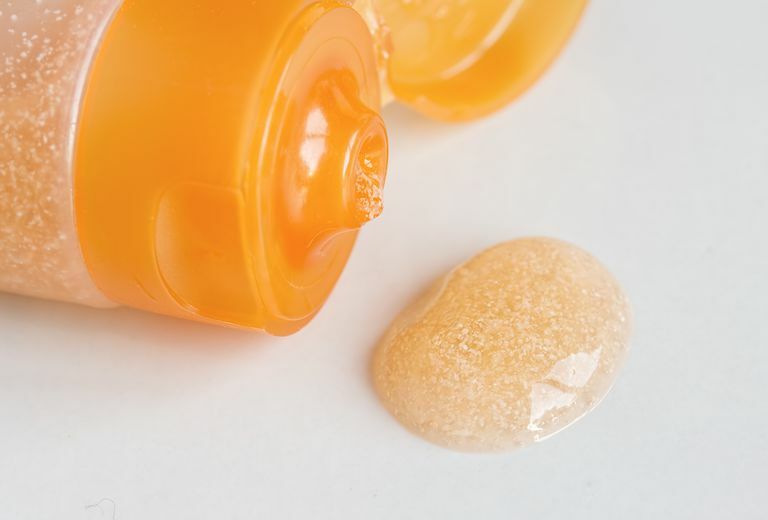 In the beauty industry, scrubs are considered physical exfoliants. The grit in the scrub can be anything from ground walnut or almond shell, ground apricot kernel meal, jojoba or wax beads, salt, sugar, and pumice, just to name a few. Plastic microbeads were also used as exfoliating ingredients in cosmetics until 2017 when they were banned in the U.S. because they were polluting waterways after being rinsed down the drain. Scrubs can leave your skin feeling softer and smoother and may make your skin look brighter too. But they aren't good skin care choices for everyone. Despite the clean feeling your skin has after a good scrubbing, it's not an effective way to treat acne. In fact, it may be making it worse, not better. While it seems like scrubbing would keep the pores unclogged and therefore reduce blackheads and pimples, the blockages that cause blemishes occur much deeper in the follicle. Scrubs might help improve minor bumps and breakouts, they just aren't going to be effective against a stubborn case of acne. Scrubs only work on the skin's surface. They can't penetrate deeper into the pore, where pimples develop. Scrubs aren't acne treatments, and scrubbing alone won't clear your skin. Unless your scrub contains a specific acne treatment ingredient, it isn't going to clear your skin. Facial scrubs are often too aggressive for blemished skin. Scrubs can be very harsh, especially on skin that is already inflamed due to acne breakouts. When you're breaking out, you may feel like you should scrub your face often, thinking it's helping to get your skin really clean. In actuality, vigorous scrubbing can increase irritation and redness, aggravate already inflamed skin, and exacerbate breakout activity. Here's where you have to listen to your skin. If you love your scrub and your skin feels good after using it (it's not red, stinging, burning, or irritated) then you're OK to continue using it. But if scrubs, even when gently used, irritate your skin it's best to remove them from your skincare routine. If you have inflammatory acne, especially if your breakouts are inflamed, crusting, oozing, or open sores, avoid scrubs altogether. This doesn't mean acne-prone skin shouldn't be exfoliated regularly. There are other ways to exfoliate the skin without resorting to an abrasive and potentially irritating product. Scrubs aren't your only exfoliating choice. There are many other products that exfoliate without abrasive particles. Called chemical exfoliants by those in the beauty biz, these products contain ingredients that dissolve the bonds that hold dead cells on the skin's surface. You can find these products over the counter, from the drug store to the salon. Stronger products can be had at the dermatology office and are available by prescription. Chemical exfoliators can be found in many different forms—from daily cleansers, toners, and moisturizers, to more powerful masks and professional chemical peels. Alpha hydroxy acids (AHAs) are very effective chemical exfoliators. They not only exfoliate and brighten the skin, but they also help stimulate collagen production. They also have the ability to penetrate more deeply than a scrub ever could. There are various types of alpha hydroxy acids, but the most popular in skin care are glycolic acid and lactic acid. Look for these ingredients in your skin care products. AHA peels are also popular in-salon treatments. Salicylic acid is a close cousin of AHAs. Salicylic acid is a common ingredient in many OTC acne treatment products. It works best on mild acne or non-inflamed breakouts. Salicylic acid is also used as a stronger treatment peel in the professional setting. Topical retinoids are only available by prescription, although you can get Differin (which is a retinoid-like compound that works essentially the same way) over the counter. These medications increase cell turnover, helping to smooth out the skin, clean out pores, fight breakouts, and fade wrinkles and hyperpigmentation. Regular exfoliation is a component of good skin care and, by default, good acne care as well. If over-the-counter treatments are not having an effect or if the acne is severe, there are many prescription acne treatments to try. So, instead of scrubbing at your skin without much improvement, put in a call to a dermatologist for help clearing your acne. United States. NIAMS/National Institutes of Health. "Questions and Answers About Acne." Bethesda, MD: U.S. Department of Health and Human Services, 2015.